On Sunday, Charlie had his first workout for the Club. He worked a 1/2 mile in 48 seconds, which was 11 of 42 for the distance. 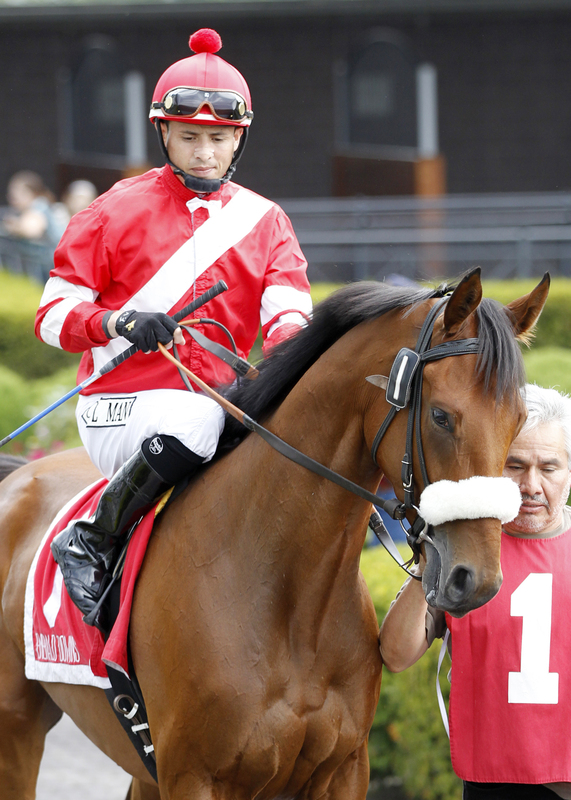 Jockey Leslie Mawing reported that Charlie felt good and did the work easily. Link to Charlie’s workout is here. You can also set up a free virtual stable through Equibase and it will send you a notification any time Charlie works or is entered to run. If you came to watch the morning workout, or have been out for training, you might get a little disoriented on where the horses are on the track and where they are going. As a rule of thumb, all horses traveling at a canter or gallop travel counter-clockwise around the track. The faster the horse goes, the closer to the rail they move. If a horse is jogging, they can “backtrack”, which means going counter to traffic on the outside rail. Jogging and/or trotting is a two-beat gait where the legs move diagonally together. Jogging is a term typically used by Western riders for a slow jog, but in racing lingo jog and trot are often interchanged. Charlie Thomas backtracks at a trot. The right front and left hind move together for one “beat” and the left front and right hind move together for the second “beat” of the two-beat gait. The canter is a three-beat gait. This may be faster than a trot, but is generally a relaxed gait that is modest in speed. As the horse picks up speed, they will transition from three-beats to the four-beat gallop. Showing the three beats at a canter. When Charlie Thomas works and trains he is at a gallop. The gallop is a four-beat gait where each foot hits the ground independently and then there is the moment of suspension where you get the dramatic photos of the horses with all four feet off the ground. Charlie appears to fly at the gallop! If you make it out to watch future training, you’ll likely see all of these gaits performed by Charlie as he goes through his morning training. First, he will jog backwards to the 1/2 mile pole, then turn around and gallop a mile to a mile and a half counter clockwise. After he pulls up, he’ll turn around and jog back to the “gap”. The gap is quite literally the “gap” in the fence where the horses come on and off the track. You are lucky at Emerald Downs that we only have one gap and it is located at the quarter chute. Other tracks may have multiple locations where the horses can access the track. Charlie worked 4 furlongs. 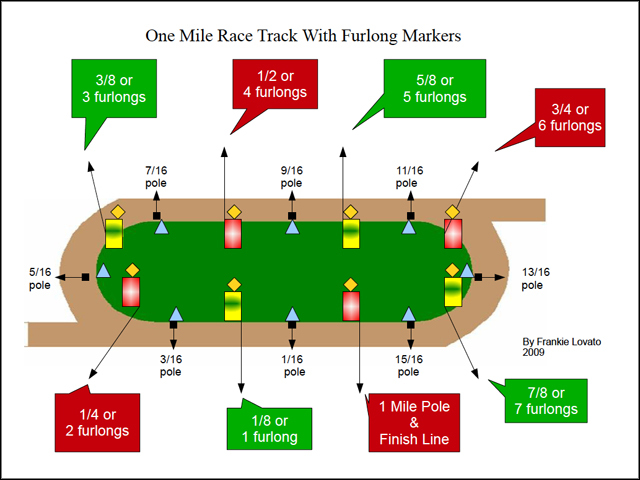 A furlong is an 1/8th of a mile so 4 furlongs equals a 1/2 mile. When Charlie worked, he would pick up speed on the back part of the racetrack and the goal is that he hits race speeds as he goes by the 1/2 mile pole. That is when the clockers will start their stopwatches. He finishes his work at the finish line and the clockers would stop their watches then. 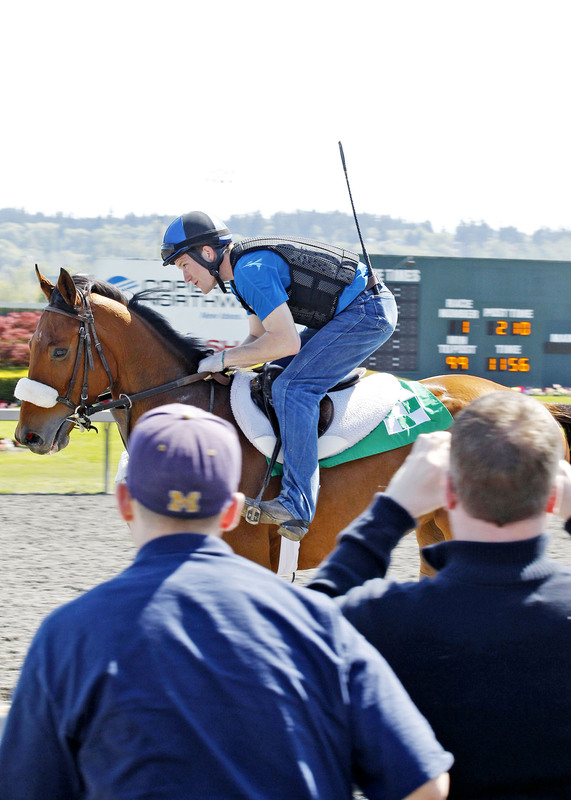 On occasion, a trainer may opt to work a horse past the wire (finish line). This means they may have a 1/2 mile work start at the 3/8 pole and go a 1/8 mile past the finish line. Horses learn very quickly where the finish line is, so this strategy of training past the finish line can teach them to keep running hard all the way until the end. If track stays good Charlie will work tomorrow 3rd after with Leslie (about 9:30 or so). Due to track conditions Charlie’s workout for Saturday has been cancelled. He will gallop instead and will be on the track at approximately 8 am. You may have noticed while watching Charlie train on Sunday that he had a great deal of white fuzzy stuff on! 1) Shadow Roll: this is a piece of sheepskin that goes on the nose band. The shadow roll partially restricts the horse’s vision, and helps him to concentrate on what is in front of him, rather than objects on the ground (such as shadows). Shadow rolls can come in varying degrees of thickness. This one is moderate. 2) Rings: “rings” refer to the triangle piece of leather with two rings that slide on the reins. The function of the rings is to give the rider more control by influencing the horse’s head position. If Charlie holds his head where it’s suppose to be, the rings are not engaged…they slide loosely on the reins. However, if he tosses his head, then he engages the rings and they correct him immediately without the rider doing anything. Most horses galloping or jogging on the track will have this piece of equipment. It helps teach a horse to carry himself in a balanced frame and gives the rider some added control. Most of the time for a workout, this piece of equipment will be removed to allow the horse to stretch his head out while in a full gallop. 3) Martingale: the rings are attached the martingale. This is also referred to as a “chicken strap” by exercise riders because they will loop a finger or two into the strap to hang on if a horse gets rambunctious. It’s like a safety belt for riders where they can hang on without pulling on the horse’s mouth. The strap goes around the horse’s neck and through their front legs to the girth. It keep the rings in place and keeps the girth from sliding backwards. In the case of Charlie, Sharon has protective sheepskin covering the leather straps to keep them from rubbing Charlie’s skin. 4) Saddle pad. Charlie has a white fluffy saddle pad under the exercise saddle. Sharon will make the determination on what pad fits each horse the best to prevent rubbing and soreness from the saddle. The saddle towel (green) goes under the saddle pad and sits next to the horse’s skin. Polos – In the photo below you will see what looks like bandages around Charlie’s legs. These are soft, fleece polos that are used to protect his legs. They have little supportive features (unlike race day bandages) but still offer a layer of protection from him grabbing himself or knocking a leg. Bell boots – On his two front hooves you can see bell boots. Named because they are shaped like a bell, they are rubber and slip over the hoof. A horse with a big stride can over reach with their hind legs and actually grab the heel of their front hoof. This helps keep Charlie from pulling off a front shoe or hitting himself. Charlie Thomas gallops in front of the Emerald Racing Club on Sunday, April 19, 2015. We had a full house for our Orientation and Party! Just to reiterate for those that were there, and for information for those that weren’t, we covered the basic barn rules and expectations moving forward. Also, lanyards were handed out and per the barn rules below, you will need to make arrangements with me to get yours. These Barn Rules are posted at emeraldracingclub.com under “Barn Rules” and you can refer to them at any time. No excuses for not knowing what they are! All Emerald Racing Club members are licensed by the Washington Horse Racing Commission as owners. This Owners License allows you access to the restricted backstretch and barn area. However, this is a privilege, not a right, and we ask that you be respectful of the barn rules as outlined below. The barn is open to visitors 6:30 am – 11:30 am on Monday, Wednesday, Thursday and Friday. The afternoon is the quiet rest time for both horses and grooms. Please be respectful of their work and only visit during the hours designated above. Charlie Thomas is located in barn 2 West. The barn is NOT OPEN to visitors any time on Saturday and Sunday unless you are escorted by an ERC volunteer. A schedule of these mini visits will be posted here. Race days are a busy time for the staff and the horses get special attention on these days. For this reason, we ask that you refrain from visiting the barn on the weekend. Watch training anytime! You are welcome to come out to the track and watch training at any time on the track apron (the tarmac stretching in front of the grandstand all along the track to the turn and Quarter Chute Cafe). Training hours are 6:30 am – 11:30 am, with a renovation break at 8:30 – 9. The track is closed for training on Tuesdays. The track kitchen aka Quarter Chute Cafe is open to the public and is a great place to watch training. You’ll also likely see Sharon Ross walking back and forth (or driving her golf cart) as each set of horses goes out to train. If you are wearing your lanyard, she’ll be able to easily recognize you as a Club member. Emerald Downs gates do not open until approximately 9 am, so if you come before that, you’ll have to enter by the Quarterchute Cafe and walk up the track apron towards the grandstand. 2) No barn visits on weekends except as escorted by an ERC volunteer. You are still welcome to watch training. 3) Wear your Emerald Racing Club lanyard with your racing license. 4) If you have guests accompanying you, you must sign them in at security and accompany them at all times. Keep groups small – no larger than 6 in a group. 6) Be respectful. There are other horses in the Ross barn owned by others. The number one question asked was when will Charlie be able to race. He was claimed April 3 and per the 45 day jail rule, he is not eligible to race until after May 18. The current condition book only extends to May 3 at this time so we are not able to consider any races after the 18th just yet. Nor will we know what level we will consider running him back at. Charlie is expected to have a workout later this week pending weather. A “workout” is where he will run at near race speed for a specific distance around the track as opposed to his regular training where he will gallop or jog. Workouts are timed by the WHRC clockers. Workouts are high intensity training sessions designed to help get a horse fit, and once he’s fit, maintain his fitness, energy, and air capacity. Workouts are scheduled based on the horse’s needs and Sharon will share with us when his workout is planned for this week. Our track photographer got some great photos of Charlie from training on Sunday. Enjoy! Charlie Thomas arrived from California a little after 1 pm today! He settled in nicely and appears to have shipped well. It is expected that Charlie will be able to train in front of the Emerald Racing Club on Sunday prior to Orientation. Meet 11:30 am on the track apron to watch Charlie train prior to going to the Emerald Room for Orientation. The track apron is the area in front of the grandstand with all the benches. The main admission gates will be open. Charlie Thomas exited his race last week in good order. According to Larry Ross, his legs look good and are “nice and cold”. He’s gone to the track at Golden Gate to train this week. 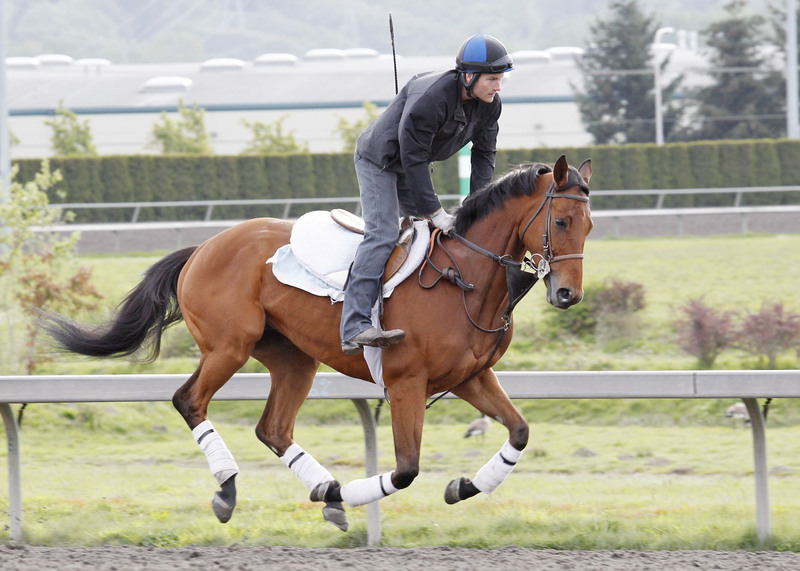 He is expected to ship up to Emerald Downs on Monday or Tuesday. 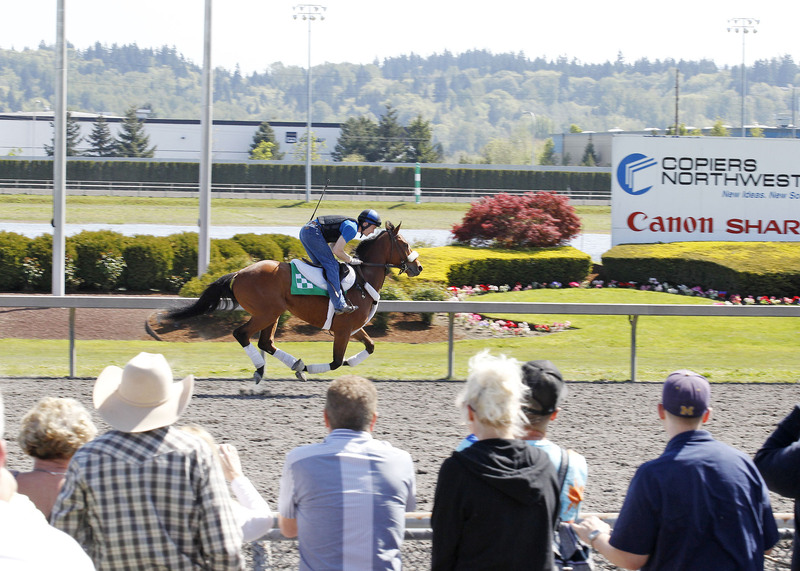 We went back through the archives and found this photo from his run in the Seattle Handicap at Emerald last year. Enjoy your horse! 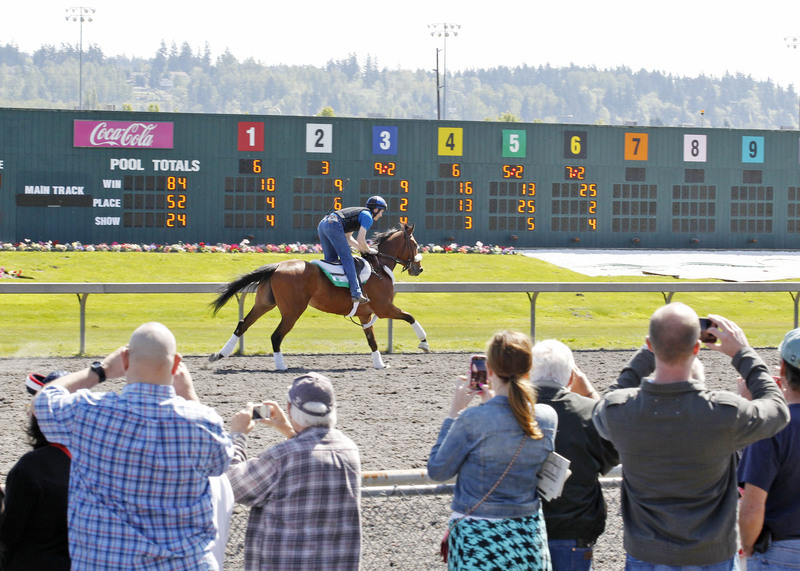 Charlie Thomas in the Seattle Slew Handicap at Emerald Downs July 13, 2014. Opening weekend is Saturday, April 18 and Sunday, April 19. We have organized a little orientation, Emerald Ed and…wait for it…party! 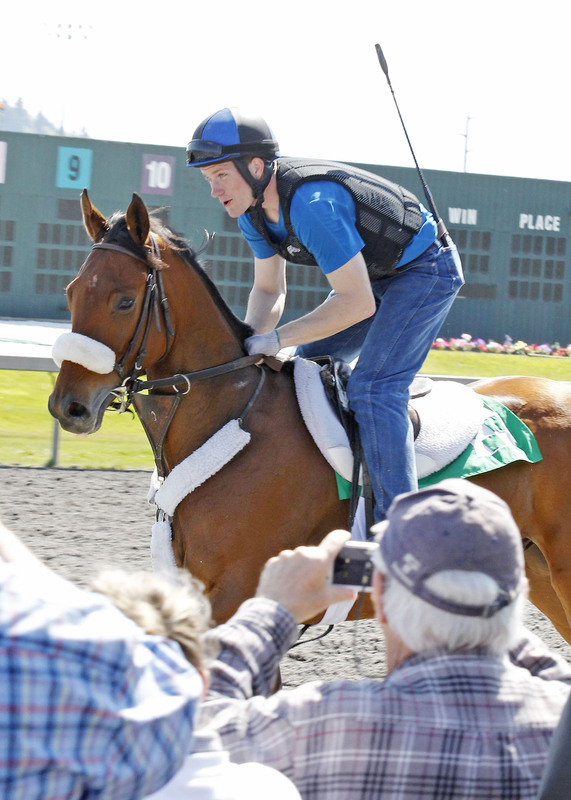 1 pm – Emerald Ed – Emerald Downs’ Dir. of Publicity, Vince Bruun, and Jacob “the professor” Pollowitz will be giving a crash course on how to read the form, handicap, and watch a race. The added bonus: they will be using Charlie Thomas’ last race. 2 pm – Party will transition to the View Room (right off the Emerald Room) with free Clubhouse Seating. 2:15 pm – Live racing starts! No cost for Emerald Racing Club members and guest. If you have additional guests you’d like to bring, they may join you for the party. Additional tickets will be $20 and can be purchased at the door. BUT – you need to email me by Wednesday, April 15 (emeraldracingclub@gmail.com) so we can account for food. Reminder: You must be licensed by Sunday, April 19. You’ll need to show your license in order to receive your Emerald Racing Club Lanyard. For those of you that came in but did not yet receive your physical license, those are being mailed to you tomorrow and should arrive before next weekend. Don’t worry, I will post a recap of the Orientation here on the blog for those unable to attend. Additional questions? Post in comments below or email me at emeraldracingclub@gmail.com. Congratulations! You are officially the owners of Charlie Thomas – a 4 year old, bay gelding claimed out of the 5th race at Golden Gate Fields today. Charlie Thomas was claimed out of a $10,000 Claimer going 1 mile on the Turf. He finished a game second after racing on the lead. 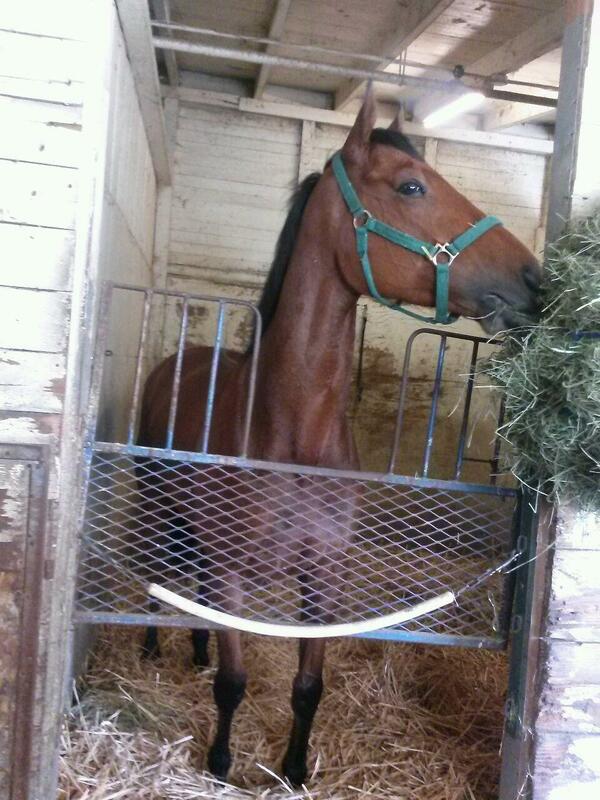 He was claimed out of his last start for $12,500 when he ran 5th and in today for $10,000, but he’s got class. What does this mean? It means that last year he was good enough to run in both the $50,000 Seattle Slew Handicap and the $50,000 Coca Cola Handicap. He finished third in both those races behind the likes of Del Rio Harbor and Noosito (Emerald Downs Three Year Old of the Meet). While we don’t know what level he will run at this year, he has quality behind him. He’s 4 years old with 22 lifetime starts, 3 wins, 5 seconds and 4 thirds for an in the money (ITM) percentage of 57%. Although he has a gap in his past performances from July 13, 2014 to December 13, 2014, he has raced each month since, indicating he recovered from whatever put him on the shelf. He has raced on turf, dirt and synthetic with good results suggesting that he is versatile enough to run on all surfaces. Trainer Larry Ross will advise us on the best time to ship him to Emerald Downs after we see how he comes out of his race. If you are going to be a racehorse owner – you need a racehorse! There are a number of ways to acquire a racehorse. We’ll discuss each briefly and then delve into how we are going about acquiring ours. 1) Breed your own. This is the most expensive way into racehorse ownership. First you must have a broodmare, then pay to breed to a stallion. Gestation is 11 months and then it’s another two years before they hit the racetrack. All total, you have expenses for a minimum of three years. Zenyatta and her 2012 foal. 2) Purchase a horse at a sale. 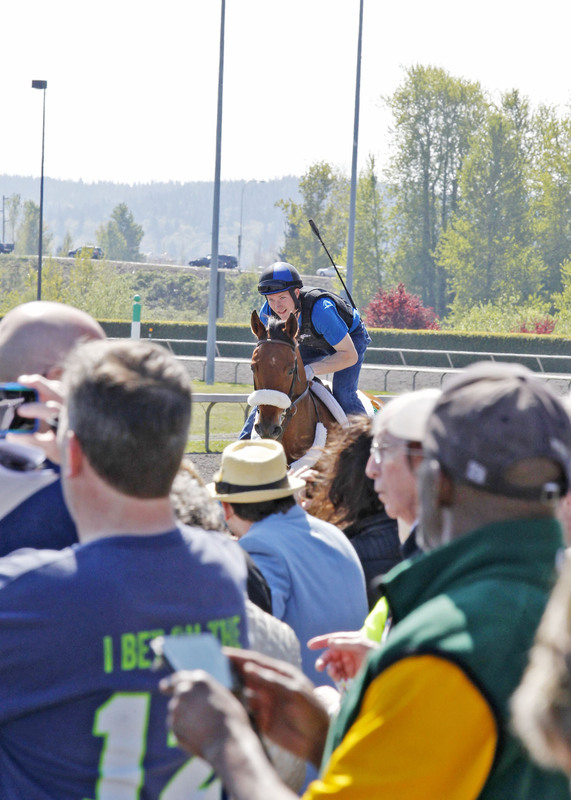 The Washington Thoroughbred Breeders and Owners Association (WTBOA) holds a yearling sale each year. 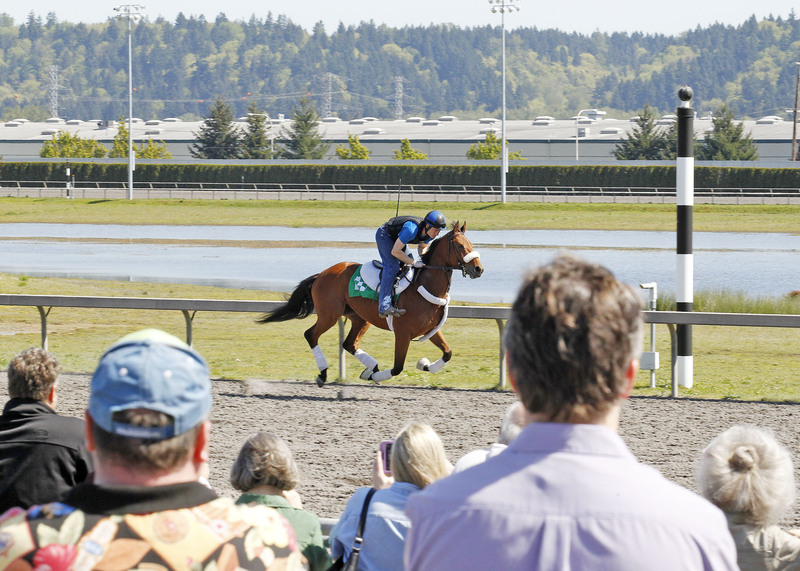 This year’s sale is August 18 and held at the Sales Pavilion at Emerald Downs. The majority of the horses in the sale are one year old and the sale is a live auction where you bid on the horse that you would like to own. Since the horse is one year old, you have your purchase price plus the expense of breaking and training the horse to prepare it for the races. Depending on the horse, they may be ready to race by their two-year-old year or three-year-old year. There are other sales around the country that have two-year-olds in training and horses of racing age. You may recognize Keeneland and Fasig Tipton as two sales company names. 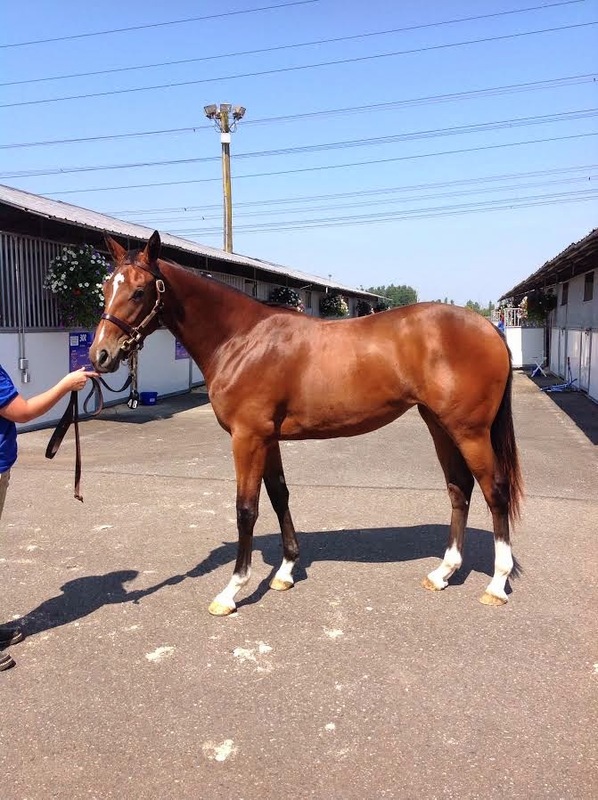 Hip #48 at the 2014 WTBOA Yearling Sale sold for $28,000. 3) Purchase a racehorse in training privately. This is an ideal way to purchase a racehorse. By purchasing privately you are able to do a pre-purchase exam with your veterinarian to check the horse’s overall health and soundness. The pre-purchase exam may help identify pre-existing conditions and save you money down the road. If the horse is already in training it can go straight to your trainer’s barn and continue it’s preparations to run. Of course, you just have to find another owner willing to sell! The other benefit is that there is no sales tax. 4) Claim a horse. Claiming horses are the bread and butter of horse racing. Claiming races account for the majority of races run in America. In a claiming race a horse is listed for a “tag” or price. This is the price for which it may be “claimed.” By running in a claiming race, anyone else may “drop a claim” for the horse provided they are licensed and have the appropriate funds with the horsemen’s bookkeeper. Running in claiming races carries a risk that you may lose your horse, but at the same time allows you to run among horses of a similar level where it can be competitive. 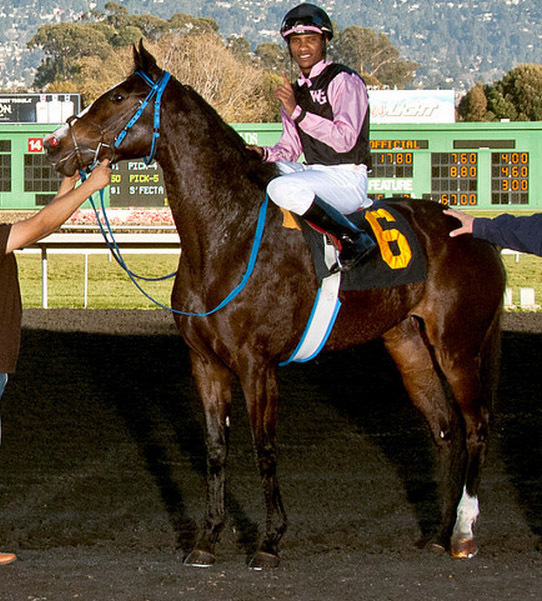 The 2014 Emerald Racing Club horses Anelina (pictured) and Dancing Yodeler were claimed from Golden Gate. Claiming a horse is the quickest way to acquire a racehorse but it can be risky. The claim must be dropped into the claim box and time stamped no later than 15 minutes prior to post time. Therefore you have short window of time to see the horse walk to the paddock and make the decision to drop a claim based just on the horse’s past performances and appearance. State rules vary slightly, but for the most part, if you drop a claim, you own that horse once the gate opens regardless of it’s performance. If the horse is scratched on post parade or in the gate prior to the running of the race, you do not get to own the horse. California recently put into effect a claiming rule that protects new owners in the event that the horse is injured while racing. If the claimed horse does not cool out to the state vet’s satisfaction in the test barn, the claim can be voided and the horse returned to the previous owner. If more than one person drops a claim on the same horse then it goes to a “shake.” And it is quite literally a shake. You place as many peas as there are people into a jar and each person shakes out a pea one at a time. The new owner of the horse is the one that gets the #1 pea. Upon being claimed, a plastic tag is hung on the horse’s bridle immediately after the race when they come back to be unsaddled. This identifies the horse as being claimed and then they are escorted to the test barn. At the test barn, the new owners’ groom will take off the bridle of the previous trainer and place their halter on the horse. 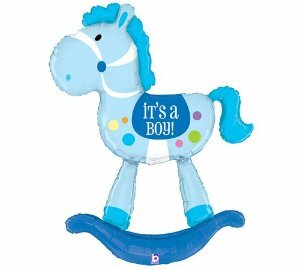 Then that’s it – the horse now belongs to the new owner and will go to a new stall. You may have heard about “jail time.” When you hear this term, it is referring to a set of rules at a track that puts claimed horses in “jail.” The jail time is the time that the horse has before they are free to run at another racetrack. This is intended to protect the horse population at a given track. If you claim a horse at Golden Gate, you may not race the horse elsewhere for 45 days OR you may run the horse back one time at Golden Gate and then be free to race it elsewhere. Claiming races may sound complicated, but once you understand the process it sheds a whole new light on the racing business and maybe even your handicapping! 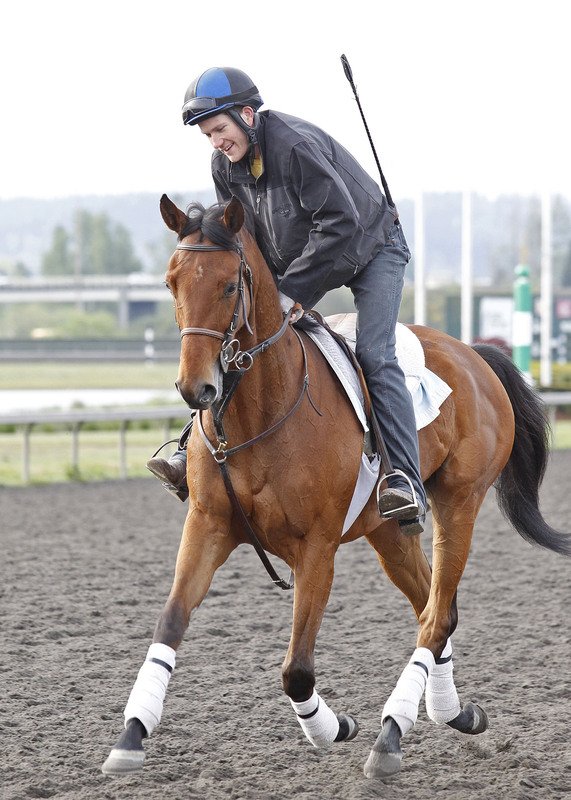 Our trainers, Larry and Sharon Ross, have been actively searching for our next horse. While Sharon trains the string at Emerald Downs, Larry is currently at Golden Gate in California evaluating potential claims and pursuing possible private purchases. In the last two months, we have identified five potential claims that we have opted to pass on. Reasons that have prevented us from filling out a claim slip center primarily on learning specific details regarding each horse’s soundness that would prevent them from having a successful career at Emerald Downs. We have “dropped a claim” (meaning we filled out a claim slip) on two separate horses, but in both instances we were “outshook.” Outshook means that multiple trainers dropped a claim on the horse and we weren’t lucky enough to shake out the right pea. And finally, we have done a pre-purchase vet exam on two others. In each pre-purchase exam, we discover a physical condition that we did not feel comfortable with. The first was a gelding that looked extremely promising on paper. To Larry’s practiced eye, he looked uncomfortable jogging and we opted to x-ray his knees. The result was discovering some bone calcification that could potentially chip off in the joint in the future – resulting in a bone chip. Bone chips can be removed, but it is an expensive surgery and takes time to recover. Given that this was a horse we were looking to purchase for less than $5,000, that would not have been a wise decision. The second horse we had examined was a filly that also looked good on paper and looked like a fit for the dirt at Emerald Downs. Examination revealed that she had a likely infection in a tooth that may or may not have reached the jawbone. While this is something that can be treated and heal, we are looking for a horse that is ready to run for this season and we don’t have the luxury of granting a couple months off. And so the search continues. Want to join in the fun? Check out entries for Golden Gate Fields and comment below! We are sticking to $3,200 – $12,500 claiming price so those are your parameters. Remember, Golden Gate is a synthetic surface so you’ll be looking for a horse suitable for a dirt surface at Emerald Downs. If you make a selection, and we pass on the horse, I’ll explain why.